Have you set up a fine kitchen to cook delicious dishes in MCPE? You will be frustrated because the game contains not many kinds of food to spend in the kitchen a lot of time and surprise friends. 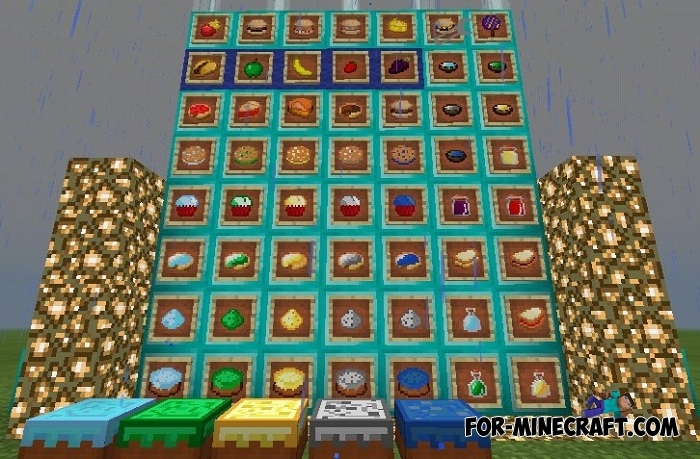 The More Food Mod adds more than 30 new types of food from drinks to delicacies. Recipes are not difficult and quite logical: for example meat dishes require the use of high temperature (stove), and for baking you will need eggs and sugar. In general, this mod will be interesting not only for cooks but also for those who adore new recipes and a fully occupied refrigerator. Pepper can be eaten (at your own risk) or get seeds and grow. Also pay attention to the Master's Furniture mod. It contains furniture elements designed for both kitchen and other rooms. How to install the More Food Mod? Open BL and select ModPE -> activate the mod.